*Stayed up until 2 AM Thursday night/Friday morning finishing it. Very powerful. Oooh awesome stash. I've been meaning to read Ruby Red but I still haven't gotten around to it! Some great books this week. Cant wait to hear your reviews on them. Please check my IMM tom. I got Fins are Forever a while back but havent had the chance to read it yet. I'm curious about Ruby Red, but have been a bit irked by time-travel stories lately, so am waiting until I'm in a happier place with that kind of book before attempting it. Forgive My Fins turned me off with the too-bright cover. It sounded like you enjoyed that, so hopefully this sequel will be just as good! I've heard whispers of Fins are Forever. Mermaids seem to be the new paranormal creature of choice. I hope you enjoy. I have Ruby Red in my TBR mountain! Can't wait to read it either. But like I said it's a mountain and not sure when I'll get to that one! But I love the cover! Happy Reading! My IMM will go up tomorrow, be sure to stop by! Great IMM! Hope you enjoy all your books. [: I've love to hear your opinions on 'Ruby Red' in the future. I've been thinking about picking it up. Awesome, Alison, you got Ruby Red this IMM, too! :D I still need to read Forgive My Fins, and I look forward to seeing your review on Fins are Forever. :) Happy reading! Wow! Isn't it great to discover a book that keeps you up all night?! Ooh! I am dying to read Ruby Red. It is definitely going to be bought in my next Nook book shopping spree. Nice haul! ruby red! i need to add that to my wish list! Great books you got this week. Ruby Red looks really good. Hope you enjoy reading all your books. Great IMM :D I really want to read Ruby Red too, I hope you enjoy it :D I can't wait for your review. I'm reading Ruby Red right now. The jury's still out on that one as to whether I like it or not. It's kind of slow going. I haven't read Forgive My Fins yet, but the covers in this series are so pretty! I love the cover of Fins Are Forever. Ruby Red looks great, and I've heard a lot of good things about it! Happy reading :). I have heard good things about Ruby Red. Happy reading. 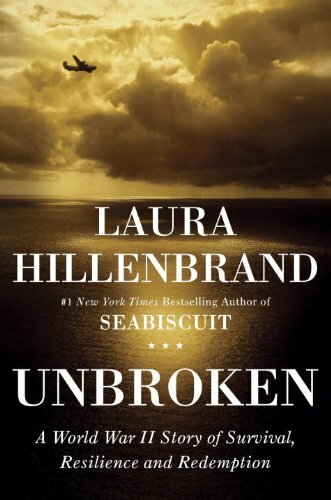 Unbroken looks like a very good read. I might be adding that to my TBR pile. And I've heard good things about Ruby Red too! Yay for getting books at the library! I've heard good things about Ruby Red so I hope you enjoy it. Stopping by from Pawing Through Books. Great IMM, hope you enjoy them all! I am now following you as well! I really need to start reading the Fins series. They look so good, but I still haven't read the first book yet. Ruby Red I won a while back hope you enjoy it. Thanks for visiting mine. Ooh, good stuff this week! Have heard good things about both Fins are Forever & Ruby Red. Enjoy! Fins are Forever sounds really cute! I've heard good things about Ruby Red too. Enjoy all of your books! Fins are Forever looks like a great book! I can't wait to read your review on it. I hope you enjoy them all! I read Fins are Forever last week, hope you like it! You have a nice list of books in your mailbox this week. I still need to read Forgive My Fins. I've added 'Fins are Forever' to my to read list. I like most anything involving mermaids! hope you like fins are forever. also, your comment count is insane! I never heard of Fins Are Forever - love the cover! Unbroken is on my iPod waiting to be listened to. I have heard that it is very good, and I was happy to see that you enjoyed it as well. I'm following you on GFC now, and I am interested in reading your review for Fins Are Forever! Fins Are Forever is a book I have been dying to read for a long time. Since Borders is going out of business, it is on my list of books to look for at a good deal. Can't wait to see what you think about it. 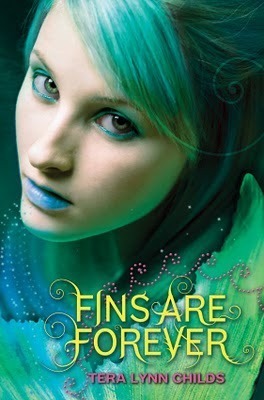 I love the cover Fins Are Forever by Tera Lynn Childs! Great books! Ruby Red is on my wishlist - I almost bought it the other day, but I had to restrain myself. Hope you enjoy it! I have Ruby Red in a stack of bought books I haven't gotten around to yet. Interesting finds! I was impressed to find a couple of shelves of teen books in my local library :) Looking forward to working through those. I've been wanting to read Fins Are Forever for so long, hope it's great!!! A great collection. Thanks for dropping by at my blog! Great mailbox! Super excited for Fins are Forever! Enjoy all of your books! I've heard mixed things about Fins are Forever. Not having read it myself, though, I can't really say whether it's a good or bad read. I hope you enjoy it, though! I've heard a little about Ruby Red, it sounds pretty good! I'd love to hear your thoughts on it!! Your library is awesome for carrying Ruby Red. Mine doesn't. Hope you enjoy it! I have been wanting to read Ruby Red for a while! Isn't the library a wonderful place!? Enjoy! Thanks for checking out my IMM! I've heard a lot about Unbroken. Glad to hear you liked it! I really enjoyed Ruby Red. I hadn't really paid attention to any of the blogosphere stuff about it, so it was a nice surprise. That's the problem with being a blogger sometimes. You don't get to be surprised that often. Ruby Red is another one that I almost threw onto my pile today to purchase. While I've seen it mentioned, there really hasn't been any discussion about it. If it's still there the next time I go to Borders it's coming home! Great Books here! I need to read Ruby Red... Looks so awesome. Happy reading! I really want to read Ruby Red. Isn't that cover gorgeous? I've heard Ruby Red is really good. And I've been interested in reading Unbroken. I hope you enjoy your books! These look like good reads! Where do you get/buy your books at? @Logan: I love Ruby Red's cover too. @Billy: I got all these from the library. That's where I get most of my books. 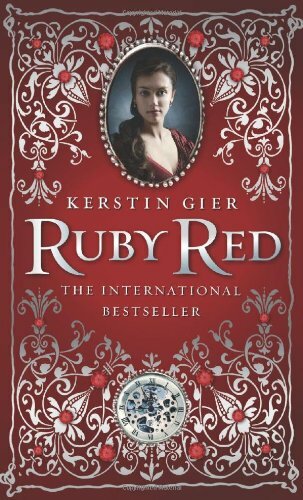 The cover of Ruby Red is just so luxe and pretty. I love it. I'd pick up the book just for that cover!